Bus Driver waited for a couple of people at the visitors center. So when we got to the plantation we were rushed to get to the different presentations. I wanted to do the tractor tour of the plantation and the driver wouldn't wait for me and my husband to do the tractor tour. I also overpaid through this site. My hotel was 2 miles from the plantation and I could have saved myself a lot of money and been able to do the whole plantation while I was there. Won't do this again. We had a wonderful time at Boone Hall Plantation we visited mainly the slave quarters which was astronomical. The plantation was full of History the Avenue of Oaks were beautiful and it makes you feel like you have step back in time. It takes you back to the old Antebellum South. It makes your skin crawl. 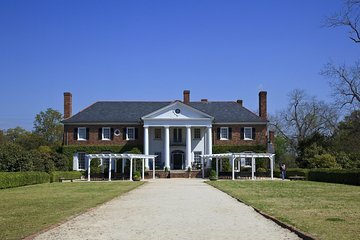 For those who want to visit a plantation with a lot of natural feeling by all means visit Boone Hall Plantation it will take you back there and the slave quarters will make you understand and feel what they felt. A great trip, I really enjoyed the tour, Bill was a great guide, he really told us lots of interesting things about Charleston and the surrounding area. Boone Hall itself is a gorgeous and very professionally run estate. Truly enjoyed the Boone Plantation especially the live performance by Miss Jackie depicting life as a slave. Although it was listed as a 4 and 1/2 hour tour, I could have used more time. The buggy ride was just in time to take a break from walking. The tour guide for the house had a lot of good stories. And the café had great sandwiches. Two stars so you read this. Meeting point for pickup with no signals; nobody to explain the process for pickup. So we were asking other tours' drivers for advice. The van's AC Was broken. The driver was ok. The plantation was ok; however, the house tour was for only four rooms!! The trip was as advertised. I did actually think the trip was going to be bused the entire trip but the bus just took you to the plantation and you were on your own for the next three hours and had to be back at the bus drop off point at scheduled time.